Chicago hotel general managers face no different challenges than the rest of the country’s hoteliers – except for the fact that Chicago for the fourth time has been named the worst bed bug city in the country. So for hotels in the Windy City, that means there’s an emphasis by patrons to over-inspect their rooms to make sure there are no bed bugs. 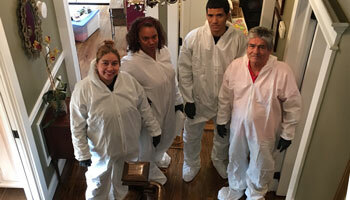 Hotels specifically continue to face a daunting battle against bed bugs on two fronts. First, the problem is costly. The financial outlay to rid a major hotel of bed bugs could be five or six figures based on the level of the infestation and how much eradication needs to take place. Second, there’s the issue of reputation – maintaining the brand’s standard as a bed-bug free hotel is important, especially with the power of social media posts and websites such as www.bedbugregistry.com. One Chicago Hotel General Manager, asked to be interviewed anonymously because being affiliated with bed bugs is obviously a negative to their clientele, said the pest remains a huge problem in the hotel industry. The General Manager says that there are a few keys to limiting exposure outside of the hotel when there is a bed bug infestation – talking to guests immediately and trying to avoid a social post is truly important, especially on Twitter where posts can be tagged to the hotel’s official Twitter account. Being preventative is very important as well. Letting guests know that you are doing everything you possibly can to provide an excellent, bug-free experience helps. 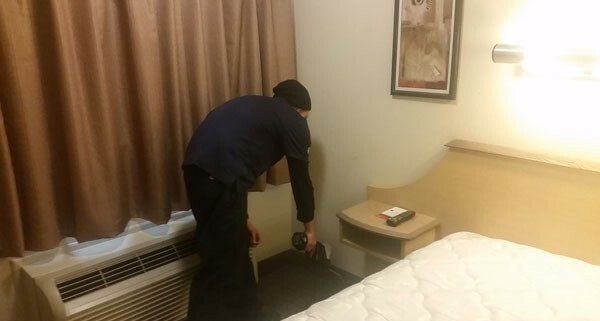 Preventing bed bugs isn’t easy but there are options for creating a hotel pest control program that is proactive – and it’s one that can be implemented by hotel staff rather than calling in a professional for additional cost. Interception devices are becoming more popular because they will attract bed bugs and once they are inside of the device, they cannot climb out and they die before reaching a food source. Being able to say that they treat their rooms and beds with green, natural products rather than chemicals is a huge benefit, said the General Manager. EcoRaider provides hotels with a proactive solution that is ideal for using in rooms because it is a natural, green product. EcoRaider does not stain linens or bedding and is safe for both children and pests. It is used in many sensitive areas because it is safe for use – especially in hotels. EcoRaider, available through a national distribution network, quickly kills bed bugs on all stages without adversary environmental effects. It demonstrates as the only natural product that kills bed bugs with 100% efficacy based on a research paper published by the Entomological Society of America’s Journal of Economic Entomology – it allows bed bug control with a green, natural product. For more information, call (201) 751-0011. Also, follow EcoRaider on our social sites on Facebook, Twitter and LinkedIn. EcoRaider – the leading green bed bug product on the market, was featured in December’s issue of PCT Magazine in an article discussing effective green solutions for bed bug control. Click below to view the article as a PDF. For more information, visit https://ecoraiderpmp.com/ or call (201) 751-0011. Also, follow EcoRaider on our social sites on Facebook, Twitter and LinkedIn.